~A wise one is never gullible. As the saying goes…don’t believe anything you hear and only half of what you see…no matter who it’s from. When you hear a sob story, are you listening to an opinion or an account of actual events? How many relationships have been destroyed by gullible good people not verifying statements from trusted sources? We hear the hurt in their voices as they recount events that describe injustices done and we want to defend our loved ones & friends against the evil that has been inflicted on them. Why would we question their side of the issues? After all, they are our best friend, our teacher, our pastor, our mentor, our parent. Why would we question? We question because we live in a fallible world. We are all one-sided human beings. We react and feel based on OUR own experiences. And just maybe, just maybe, they themselves do not know the other side. We woke up to a bang outside our bedroom window a few weeks back. Big bangs are never a peaceful way to start the morning. It always means my coffee will be delayed. Not good. 😦 My husband went out to see if everyone was safe. The teenage boy who crossed the middle line on his way to school was a fairly new driver. I felt sorry and glad for him at the same time. While it’s never good to be in any accident, sometimes, especially for boys, having a non-injury accident early on teaches hard lessons in humility. 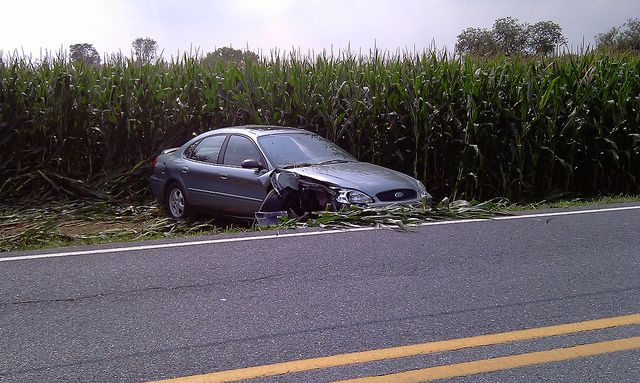 The first-hand account from the second vehicle following the youth claimed the youth was trying to pass another vehicle and he did not have enough room to return to his lane before hitting the oncoming truck, spinning both the youth’s car and the truck off into the cornfield. Of this, he was certain of what he witnessed. The problem is…there was no vehicle in front of the youth for him to pass…in all actuality, he was reaching in the passenger’s seat for his brush. I guess he forgot to look in the mirror before leaving home. When mom arrived, taking pictures on her cell phone, he was definitely red-faced! This is why law enforcement are trained to take all statements before writing up a report. They look at all angles before making any conclusions. Basically…they unknowingly adhere to the **gasp** Bible… “He who states his case first seems right, until his rival comes and cross-examines him.” ~Proverbs 18:17 . Why can’t we do that with our relationships? Do we really…really…know what it is we think we know?? Maybe…just maybe…we should at least ask?? Maybe…just maybe…that is what you would want others to do for you?? This entry was posted in Devotions & Proverbs & Psalms and tagged character, Christianity, family, Forgiveness, inspiration, Parents, Proverbs, Relationships, truth. Bookmark the permalink.